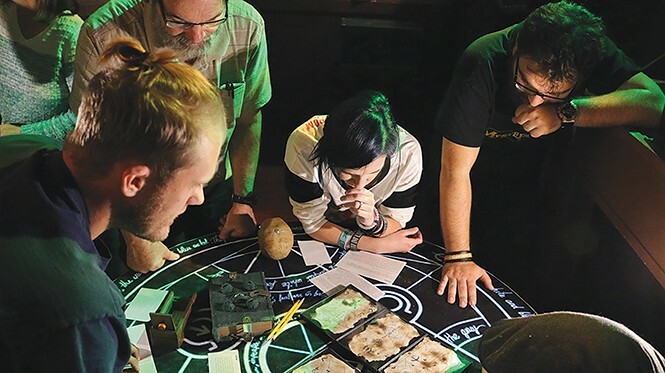 Offering immersive, real-world adventures, escape rooms are growing in popularity—in Utah and beyond. You're in a train station. A magical creature has escaped, and you need to make sure it's captured before someone gets hurt or killed. Or you're in a spaceship, hurtling toward a star with classified cargo that puts the entire universe at risk. While these scenarios might sound like cut subplots from Fantastic Beasts and Where to Find Them or Interstellar, they're not movies. They're games you can play—right here in Salt Lake City. Over the past few years, escape rooms have skyrocketed in popularity. For those who don't know, escape rooms are immersive real-world games. You and your team are locked in a room and have to solve a series of puzzles—organized around a particular story—to get out. Sometimes those puzzles take on the theme of a film, a book or some other part of pop culture. Local escape room plots include dozens of mildly familiar universes—such as those of Harry Potter, Sherlock Holmes, Alice in Wonderland and dozens of others. For the Halloween season, a few venture into zombie worlds: Get Out Games (getoutgames.com) has a room with a zombie chained in the middle of it, challenging trapped players to get out alive. Watchtower Café (watchtower-cafe.com) features a smaller experience where a handful of participants must prevent a zombie apocalypse. Castle of Chaos (castleofchaos.com) also offers two scary escapes. Roberto Fernandez, location manager of the Mystery Escape Room at The Gateway (mysteryescaperoom.com), says part of the allure is the collaborative facet. "It's that sense of teamwork, accomplishment and immersion," he says. "Nowhere else can you get an in-depth dive into a new world with a challenge in real life. The Mystery Escape Room particularly prides itself in helping people realize how to build better relationships and teams through our games." They, too, have Halloween-themed rooms: one set in Dracula's Castle, where the end-game is to put a stake through the king vampire's heart; another one takes you into the maddening depths of Lovecraft, working to prevent the Old Ones of Cthulhu from devouring the earth. In a world dominated by video games and other on-screen entertainment, there's something refreshing about keeping your phone in your pocket for an hour and dedicating yourself to solving a puzzle. Escape rooms take the idea of team sports one step further with the element of intellectual stimulation. "All generations can enjoy them," Fernandez says. "They are so versatile; it's hard to only do just one." Brian Dove, the mastermind behind the Castle of Chaos and Watchtower Café installations, says video games are actually the origin. "It is believed that the first escape room game was built in Japan in 2007, inspired by mobile escape-game apps. The creator loved the mobile games, and wanted to create a real-life version," he explains. "From there, the games spread through Japan, then surfaced in Europe in 2011 and the U.S. in 2012." With more and more augmented and virtual-reality games providing immersive experiences, it's no wonder the rooms are gaining popularity around the world. The Mystery Escape Room at The Gateway opened in November 2014, but has since moved to a larger space and sprouted a second location in St. George. Watchtower Café added their single-room experience just this year. There's no doubt the trend will continue to grow. And the Halloween season is the perfect time to try.